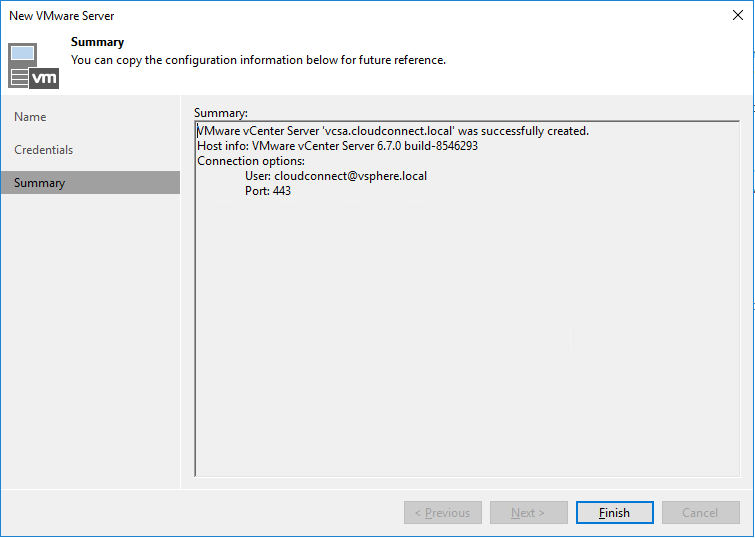 In order to offer replica resources for a DRaaS solution, a service provider needs to build and connect to Veeam Cloud Connect a virtualized environment, based on one of the supported hypervisor technologies: VMware vSphere, VMware vCloud Director, or Microsoft Hyper-V. Veeam doesn&apos;t perform any conversion between the two supported platforms, so it can be a good choice for a service provider willing to onboard more customers to have both the platforms available for his customers. NOTE: In this book, replica resources will be offered using only a VMware platform. Even if many concepts can be applied also to Microsoft Hyper-V, please refer to the official Veeam User Guide for more information. To serve customers, the service provider builds a VMware vSphere environment. There are so many possible configurations and options, that it would be impossible to suggest the best one. Every VMware architect can design and deploy a working vSphere solution that is in line with the business requirements of the service provider he works for. Even if Veeam Cloud Connect can work with single hosts, the correct choice for a true DR environment should be a proper cluster, with all the necessary redundancy in place (shared storage, HA, DRS). This is to avoid that any problem to a single host can interrupt the entire service. Veeam Cloud Connect uses Veeam replication technology to create replica VMs in the DR environment. What&apos;s important in order to guarantee a complete compatibility between the tenant&apos;s production environment and the Veeam Cloud Connect platform is not the version of vSphere, but rather the virtual hardware of the replicated VMs. As long as the version of vSphere the service provider uses can accept VMs created in the tenant’s vSphere environment, any combination of vSphere versions between the two sites is accepted. Obviously, in order to guarantee the best compatibility, a service provider should use the latest version of vSphere. If available, use distributed switches. Veeam Cloud Connect supports both standard and distributed switches, and Veeam Cloud Connect configures new port groups automatically in both scenarios. However, distributed switches are easier to manage on large infrastructures. 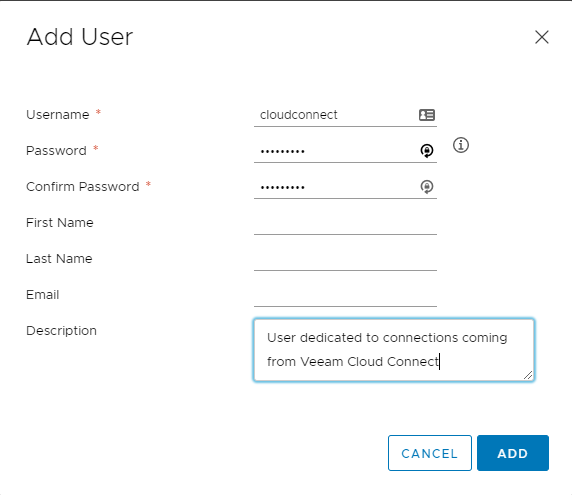 With this dedicated account, it is easier to filter logs and identify activities belonging to Veeam Cloud Connect in vCenter, so problem solving should be easier. 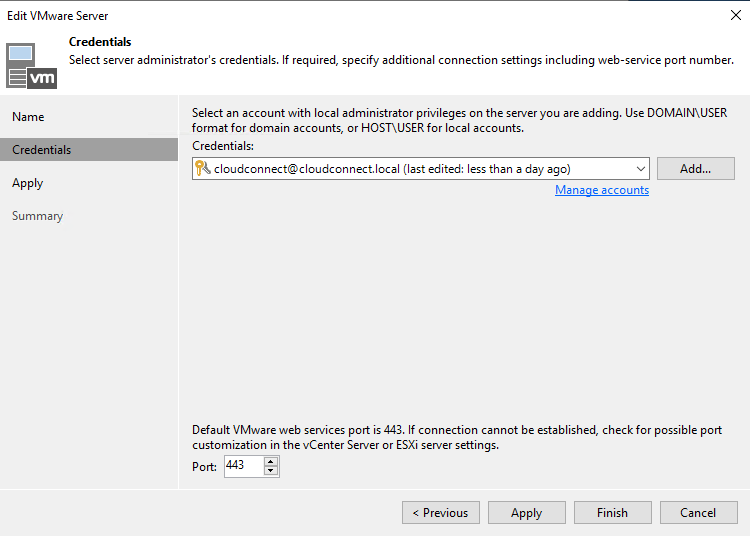 Additionally, it is extremely easy to disable any access of Veeam Cloud Connect to the vSphere environment, if needed, by simply disabling this user.